In an effort to make as much use of the colder months in New England as I can, I’m running tons of Stanford University’s Folding@Home on my computer to do charitable science for disease research while heating my house. In the last article, I reviewed a slightly older AMD card, the RX 480, to determine its performance and efficiency running Folding@Home. Today, I’ll be taking a look at one of the favorite cards from Nvidia for both folding and gaming: The 1070 Ti. The GeForce GTX 1070 Ti was released in November 2017, and sits between the 1070 and 1080 in terms of raw performance. As of February 2019, the 1070 Ti can be for a deep discount on the used market, now that the RTX 20xx series cards have been released. I got my Asus version on eBay for $250. Based on Nvidia’s 14nm Pascal architecture, the 1070 Ti has 2432 CUDA cores and 8 GB of GDDR5 memory, with a memory bandwidth of 256 GB/s. The base clock rate of the GPU is 1607 MHz, although the cards automatically boost well past the advertised boost clock of 1683 Mhz. 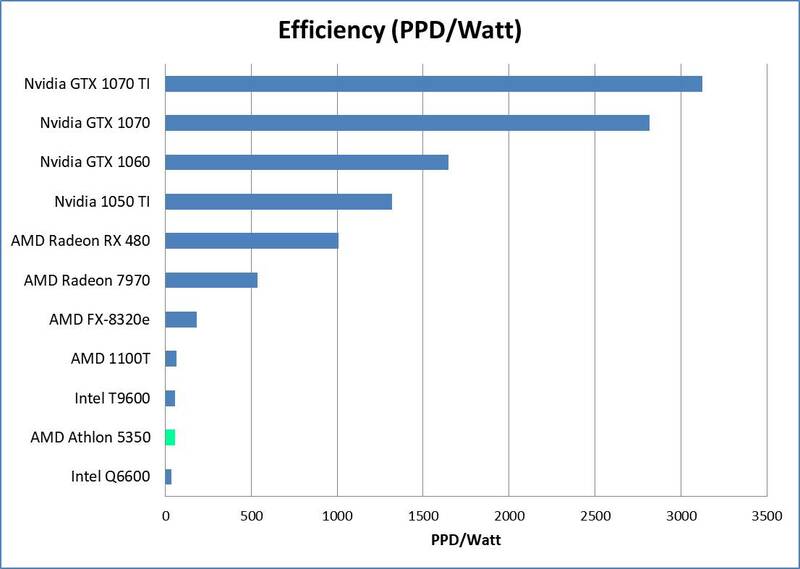 Thermal Design Power (TDP) is 180 Watts. The 3rd party Asus card I got is nothing special. 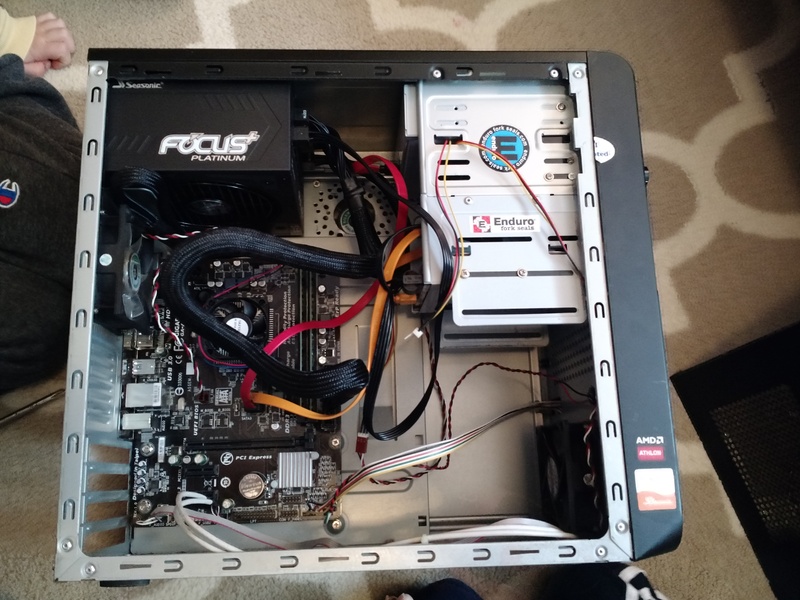 It appears to be a dual-slot reference design, and uses a blower cooler to exhaust hot air out the back of the case. It requires one supplemental 8-pin PCI-E Power connection. One thing I will note about this card is it’s length. At 10.5 inches (which is similar to many NVidia high-end cards), it can be a bit problematic to fit in some cases. I have a Raidmax Sagitta mid-tower case from way back in 2006, and it fits, but barely. I had the same problem with the EVGA GeForce 1070 I reviewed earlier. 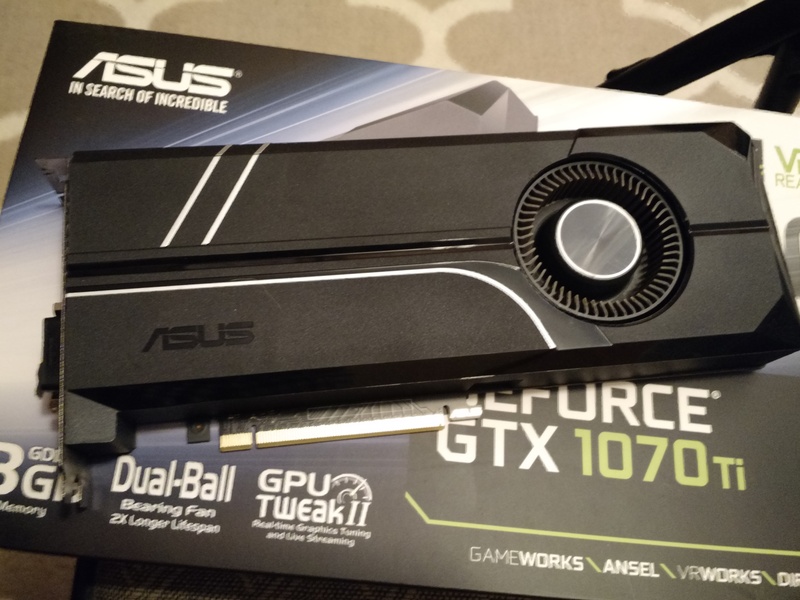 ASUS GTX 1070 Ti – Installed. Testing was done in Windows 10 on my AMD FX-based system, which is old but holds pretty well, all things considered. You can read more on that here. The system was built for both performance and efficiency, using AMD’s 8320e processor (a bit less power hungry than the other 8-core FX processors), a Seasonic 650 80+ Gold Power Supply, and 8 GB of low voltage DDR3 memory. The real key here, since I take all my power measurements at the wall with a P3 Kill-A-Watt meter, is that the system is the same for all of my tests. These settings tend to result in a slighter higher points per day (PPD), because they request large, advanced work units from Stanford. Initial testing was done on one of the oldest drivers I could find to support the 1070 Ti (driver version 388.13). The thought here was that older drivers would have less gaming optimizations, which tend to hurt performance for compute jobs (unlike AMD, Nvidia doesn’t include a compute mode in their graphics driver settings). Unfortunately, the best Nvidia driver for the non-Ti GTX 10xx cards (372.90) doesn’t work with the 1070 Ti, because the Ti version came out a few months later than the original cards. So, I was stuck with version 388.13. I ran F@H for three days using the stock clock rate of 1823 MHz core, with the memory at 3802 MHz. Similar to what I found when testing the 1070, Folding@Home does not trigger the card to go into the high power (max performance) P0 state. Instead, it is stuck in the power-saving P2 state, so the core and memory clocks do not boost. The PPD average for three days when folding at this rate was 632,380 PPD. Checking the Kill-A-Watt meter over the course of those days showed an approximate average system power consumption of 220 watts. 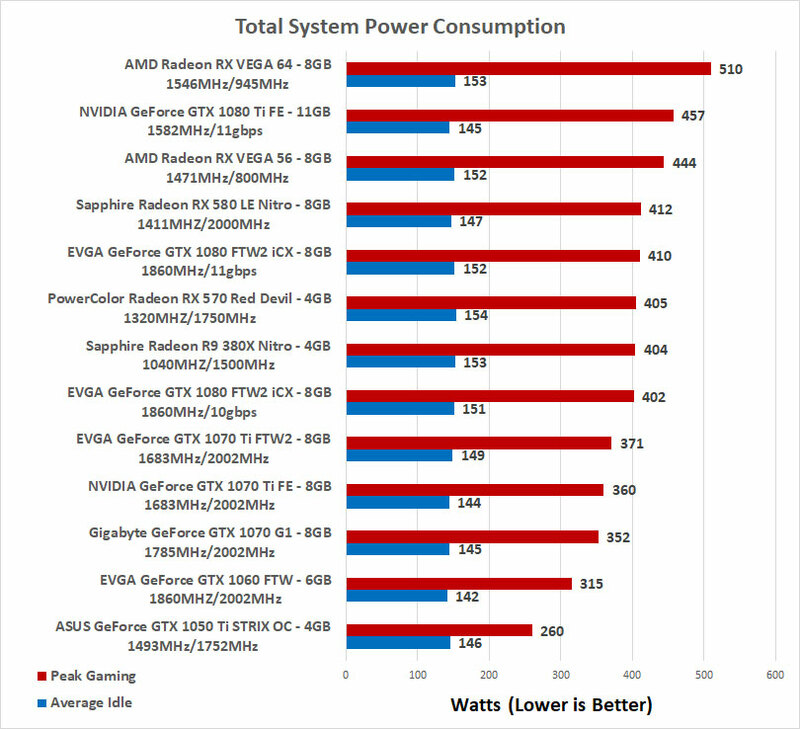 Interestingly, this is less power draw than the GTX 1070 (which used 227 watts, although that was with overclocking + the more efficient 372.90 driver). 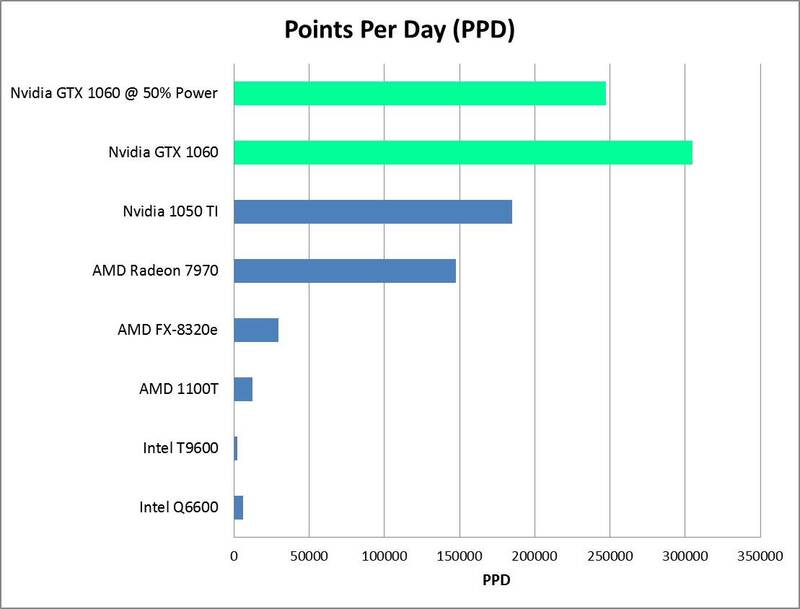 The PPD average was also less than the GTX 1070, which had done about 640,000 PPD. 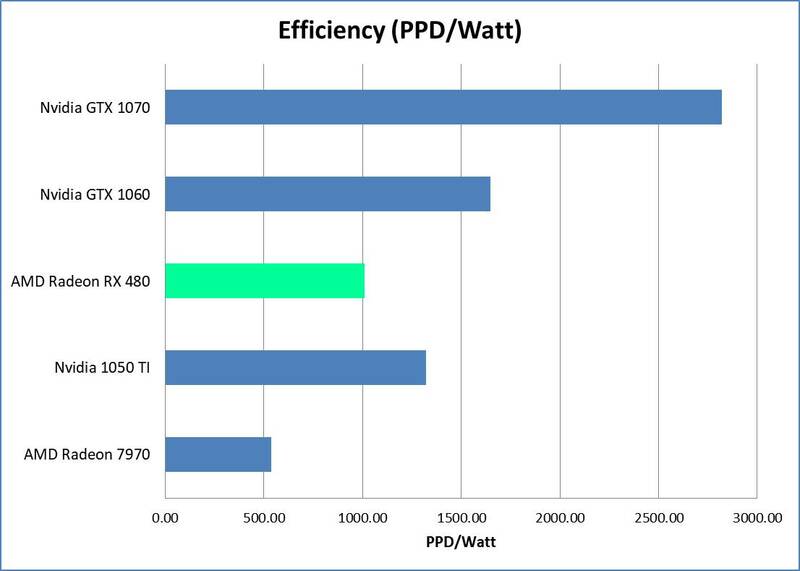 Initial efficiency, in PPD/Watt, was thus 2875 (compared to the GTX 1070’s 2820 PPD/Watt). The lower power consumption number and lower PPD performance score were a bit surprising, since the GTX 1070 TI has 512 more CUDA cores than the GTX 1070. However, in my previous review of the 1070, I had done a lot of optimization work, both with overclocking and with driver tuning. So, now it was time to do the same to the 1070 Ti. By running UNIGINE’s Heaven video game benchmark in windowed mode, I was able to watch what the card did in MSI afterburner. The core clock boosted up to 1860 MHz (a modest increase from the 1823 base clock), and the memory went up to 4000 MHz (the default). 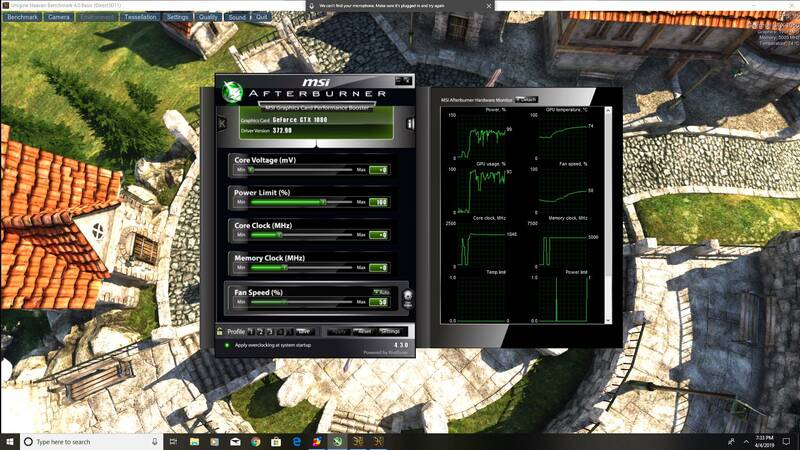 I tried these overclocking settings and saw only a modest increase in PPD numbers. So, I decided to push it further, despite the Asus card having only a reference-style blower cooler. From my 1070 review, I found I was able to fold nice and stable with a core clock of 2012 MHz and a memory clock of 3802 MHz. So, I set up the GTX 1070 Ti with those same settings. After running it for five days, I pushed the core a little higher to 2050 Mhz. A few days later, I upgraded the driver to the latest (417.71). With these settings, I did have to increase the fan speed to keep the card below 70 degrees Celsius. 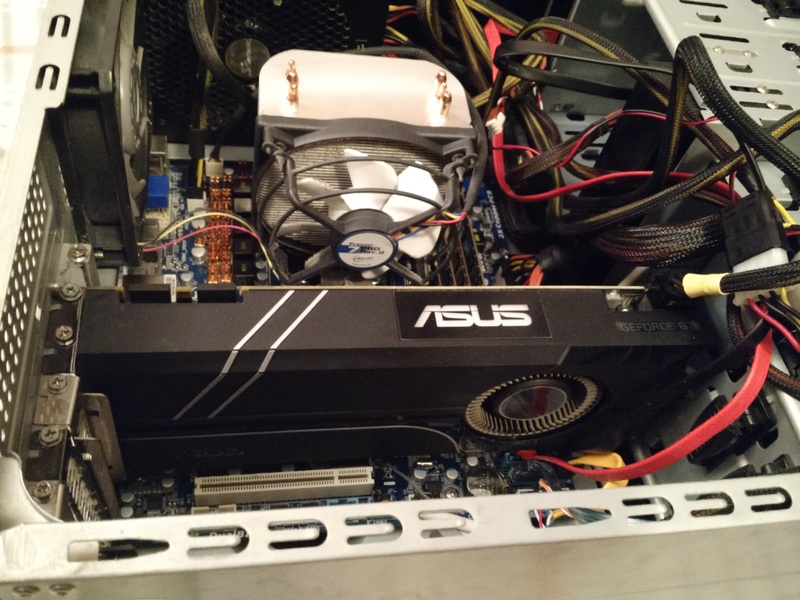 Since the Asus card uses a blower cooler, it was a bit loud, but nothing too crazy. Open-air coolers with lots of heat pipes and multiple fans would probably let me push the card higher, but from what I’d read, people start running into stability problems at core clocks over 2100 Mhz. Since the goal of Folding@home is to produce reliable science to help Stanford University fight disease, I didn’t want to risk dropping a work unit due to an unstable overclock. As you can see below, the overclock helped improve the performance of the GTX 1070 Ti. Using the last five days worth of data points (which has the graphics driver set to 417.71 and the 2050 MHz core overclock), I got an average PPD of 703,371 PPD with a power consumption at the wall of 225 Watts. 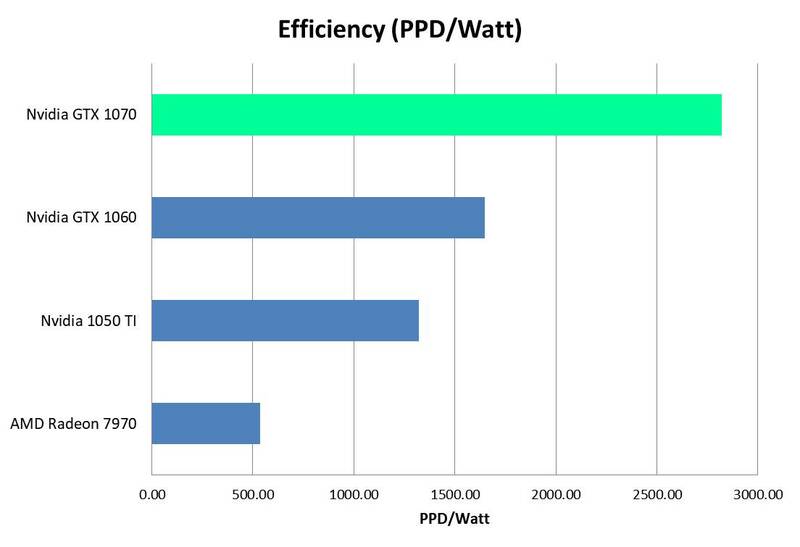 This gives an overall system efficiency of 3126 PPD/Watt. Finally, these results are starting to make more sense. Now, this card is outpacing the GTX 1070 in terms of both PPD and energy efficiency. However, the gain in performance isn’t enough to confidently say the card is doing better, since there is typically a +/- 10% PPD difference depending on what work unit the computer receives. This is clear from the amount of variability, or “hash”, in the time history plot. Interestingly, the GTX 1070 Ti it is still using about the same amount of power as the base model GTX 1070, which has a Thermal Design Power of 150 Watts, compared to the GTX 1070 Ti’s TDP of 180 Watts. So, why isn’t my system consuming 30 watts more at the wall than it did when equipped with the base 1070? I suspect the issue here is that the drivers available for the 1070 Ti are not as good for folding as the 372.90 driver for the non-Ti 10-series Nvidia cards. 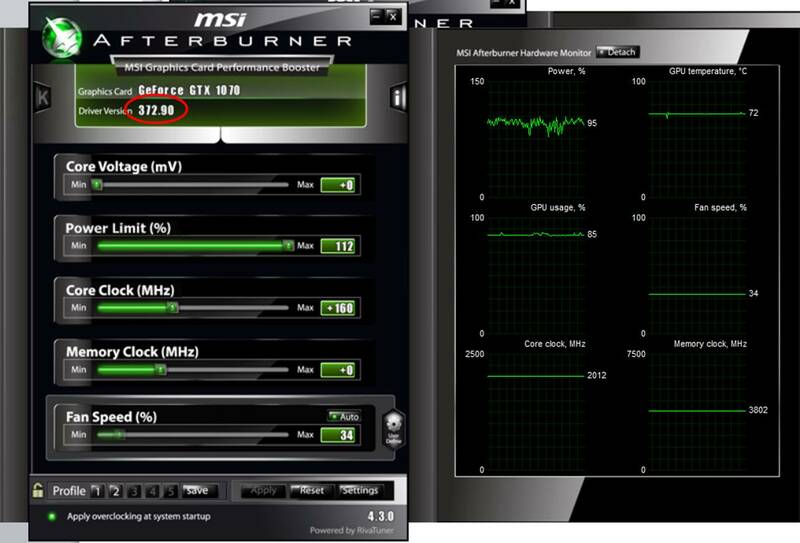 As you can see from the MSI Afterburner screen shots above, GPU Usage on the GTX 1070 Ti during folding hovers in the 80-90% range, which is lower than the 85-93% range seen when using the non-Ti GTX 1070. In short, folding on the 1070 Ti seems to be a bit handicapped by the drivers available in Windows. Here are the Production and Efficiency Plots for comparison to other cards I’ve tested. The Nvidia GTX 1070 Ti is a very good graphics card for running Folding@Home. With an average PPD of 703K and a system efficiency of 3126 PPD/Watt, it is the fastest and most efficient graphics card I’ve tested so far. As far as maximizing the amount of science done per electricity consumed, this card continues the trend…higher-end video cards are more efficient, despite the increased power draw. One side note about the GTX 1070 Ti is that the drivers don’t seem as optimized as they could be. This is a known problem for running Folding@Home in Windows. But, since the proven Nvidia driver 372.90 is not available for the Ti-flavor of the 1070, the hit here is more than normal. 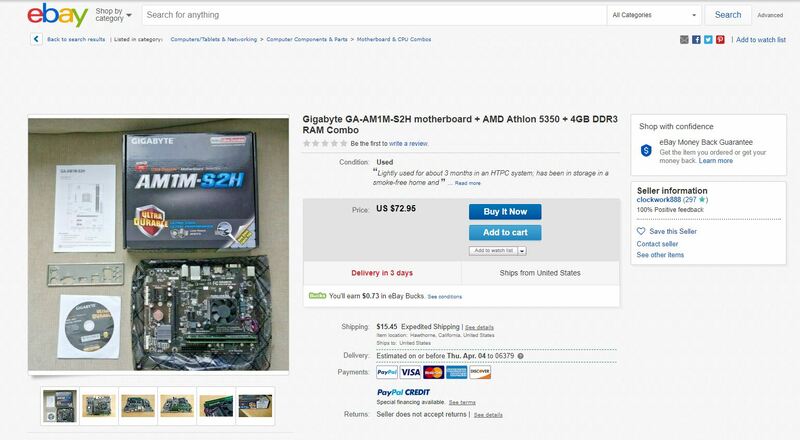 On the used market in 2019, you can get a GTX 1070 for $200 on ebay, whereas the GTX 1070 Ti’s go for $250. My opinion is that if you’re going to fold in Windows, a tuned GTX 1070 running the 372.90 driver is the way to go. To fully unlock the capability of the GTX 1070 Ti, I realized I’m going to have to switch operating systems. Stay tuned for a follow-up article in Linux. I’ve been reviewing a lot of Nvidia cards lately, so it’s high time I mixed it up a bit. The 4xx series of cards from AMD were released in June 2016, and featured AMD’s new Polaris 14nm architecture. The flagship card, the RX 480, was available in a 4 GB and 8 GB version. The Polaris architecture, which in the RX 480 features 2034 stream processors at a base clock rate of 1120 MHz (1266 boost) and a TDP of 150 watts, was designed to be more efficiency than the aging Fiji architecture used in the R5/R7/R9 300 series. Now that these cards can be obtained relatively inexpensively on eBay. 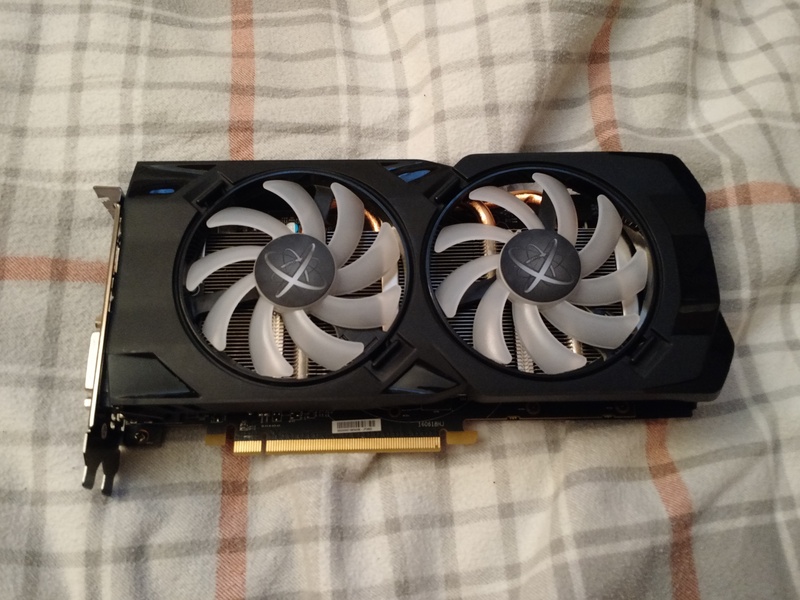 I picked up a second hand 8 GB card from XFX for $90. Let’s see how it folds compared to some similar graphics cards from Nvidia from that time period. Namely the 1050 and 1060. 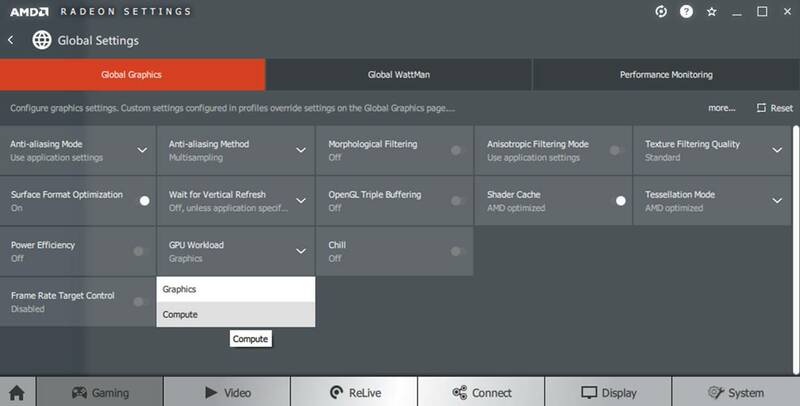 The video driver used was Crimson ReLive 17.7, which includes an essential option for running compute jobs like Folding@Home. This is the ‘compute’ mode for GPU Workload. As previously reported by other folders, this setting can offer significant performance improvement vs. the default gaming setting. I tested it both ways. Make sure to set GPU Workload to ‘Compute’ for running Folding@Home Work Units! Monitoring of the card while folding was done with MSI Afterburner. My particular version of the card by XFX got up to about 76 degrees C when folding, which is pretty warm but not dangerous. The fan settings were on auto, and it was spinning nice and quietly at a touch over 50% speed. The GPU workload % was nicely maxed out at 100 percent, which is something not typically seen on Nvidia cards in Windows. As expected, Folding@Home doesn’t use the full 150 watt TDP. The power usage, as reported at the card, bounced around but was centered at about 110 watts. Although it is expected that the actual power usage would be less than the TDP, this is a lot less, especially considering the 100% GPU usage. I suspect something might be fishy, considering my total system power consumption was pretty high (more on that later). Initially, I tested out the driver setting to see if there was a difference between ‘graphics’ and ‘compute’ mode. Although I didn’t see much of a power consumption change (hard to tell since it bounces around), the PPD as reported from the client did change. Note for this testing, I just flipped the switch and observed the time-averaged PPD results as reported from the client. The key here is the project (14152) was the same in both cases, so the result is directly comparable. That is a pretty significant increase in performance by just flipping a switch. In short, on AMD cards running Folding@Home, always use compute mode. If you’ve been following along, you know I don’t like to rely on the client’s estimated values for overall PPD numbers. The reason is that it is just an estimate, and it varies a lot between work units. However, for this quick test of graphics vs. compute mode on the same work unit, the results are consistent with those found by other testers. I like to run cards for a few days on a variety of work units in order to get some statistics, which I can average to provide more certain results. In this case, I ran folding@home on my RX 480 for over three days. 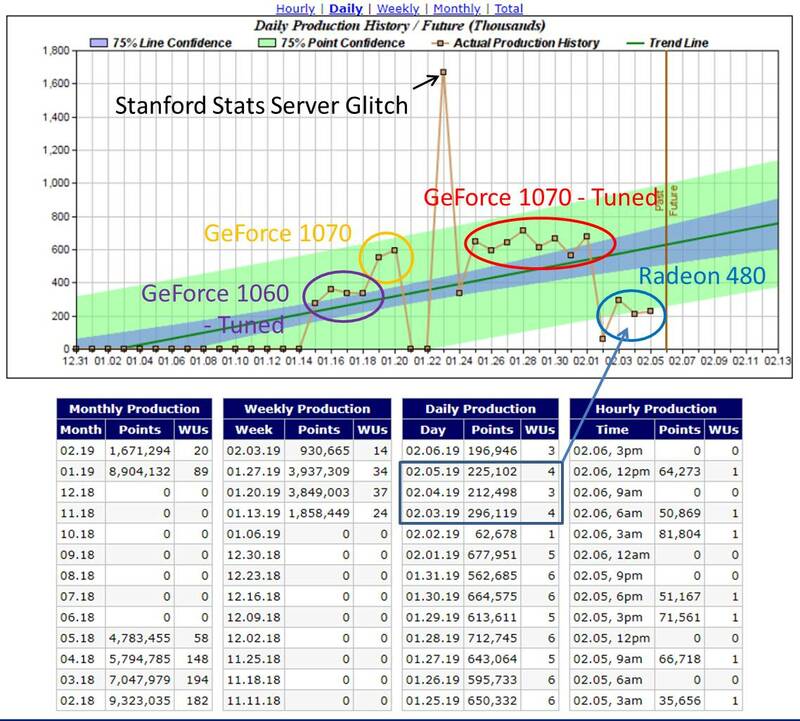 Here are the stats from Stanford’s server, as reported by the kind folks over at Extreme Overclocking. 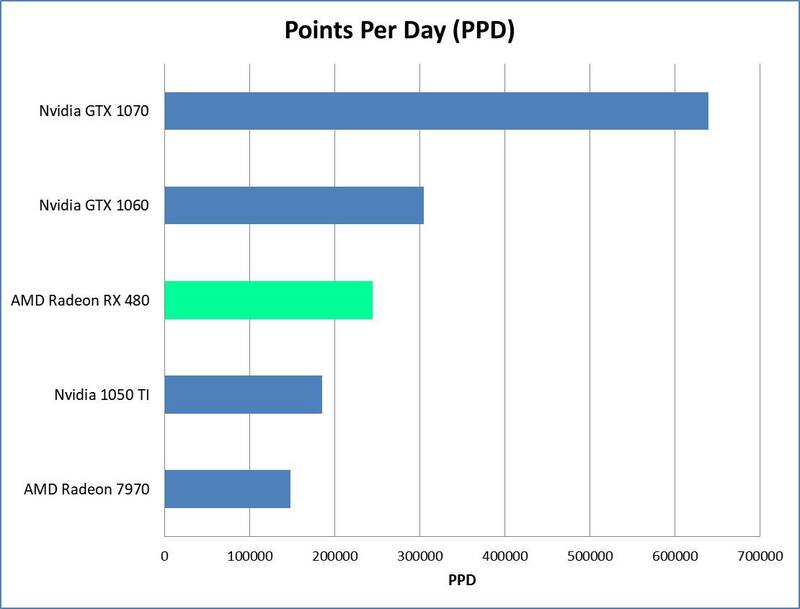 As you can see, the average PPD of about 245K PPD wasn’t that impressive, although to be fair the other cards on this plot are all in higher performance price points, except possibly the 1060. I also think this card has potential to churn out over 300k PPD as estimated by the client. This thread seems to suggest this is possible, although the card in that test was overclocked to 1328 MHz vs the 1288 MHz I was running (I didn’t have time to do any overclock testing on mine). Power consumption measured at the wall varied a bit with the different work units. Spot-checking the numbers with my P3 watt meter resulted in an approximate average total system power consumption of 243 watts. This is much higher than my EVGA GTX 1060 (185 watts at the wall). 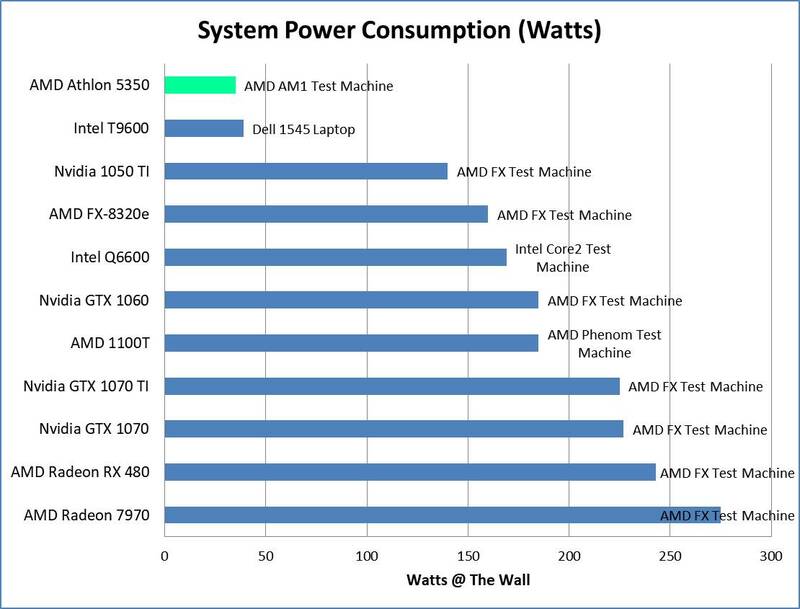 Just going by the TDP of both cards, I would have guessed the wall power consumption to be somewhere around 215 watts (since the TDP of the RX 480 is 30 watts higher than the 1060). I ended up selling this card on Ebay a lot faster than I had planned, so I wasn’t able to do detailed testing. However, I suspect the actual power consumption at the card was much higher than what was being reported in MSI Afterburner. After doing some research, it turns out the RX 480 is known to overdraw from both the PCI Express Slot and the supplemental PCI-E power cable. For a card designed to be more efficient, this one is a failure. The AMD RX 480 produces about 245K PPD while using a surprisingly high 243 watts of system power (measured at the wall). The efficiency is thus about 1000 PPD/Watt. Although better than AMD’s older cards such as a Radeon 7970, these numbers aren’t very competitive, especially when compared to Nvidia’s GTX 1060 (a similarly-priced card from 2016). As of Feb. 2019, the RX 480 can be obtained used for about $100, and the GTX 1060 for $120. If you’re considering buying one of these older cards to do some charitable science with Folding@Home, I recommend spending the extra $20 on the Nvidia 1060, especially because with a mild overclock and a few driver tweaks (use the 372.90 drivers), the Nvidia 1060 can crank out over 350K PPD. Distributed computing projects like Stanford University’s Folding@Home sometimes get a bad rap on account of all the power that is consumed in the name of science. Critics argue that any potential gains that are made in the area of disease research are offset by the environmental damage caused by thousands of computers sucking down electricity. This blog hopes to find a balance by optimizing the way the computational research is done. In this article, I’m going to show how a simple setting in the graphics card driver can improve Folding@Home’s Energy Efficiency. F@H Efficiency: Overclock or Undervolt? The GPU Power limit slider is a quick way to control how much power the graphics card is allowed to draw. Typically, graphics cards are optimized for speed, with efficiency a second goal (if at all). When a graphics card is pushed harder, it will draw more power (until it runs into the power limit). Today’s graphics cards will also boost their clock rate when loaded, and reduce it when the load goes away. Sometimes, a few extra MHz can be achieved for minimal extra power, but go too far and the amount of power needed to drive the card will grow exponentially. Sure the card is doing a bit more work (or playing a game a bit faster), but the heaps of extra power needed to do this are making it very inefficient. What I’m going to quickly show is that going the other way (reducing power) can actually improve efficiency, albeit at a reduction of raw output. For this quick test, I’m just going to look a the default power limit, 100%, vs 50%. Specific tuning is going to be dependent on your actual graphics card. But, with a few days at different settings, you should be able to find a happy balance between performance and efficiency. For these plots, I used my watt meter to obtain actual power consumption at the wall. You can read about my watt meters here. 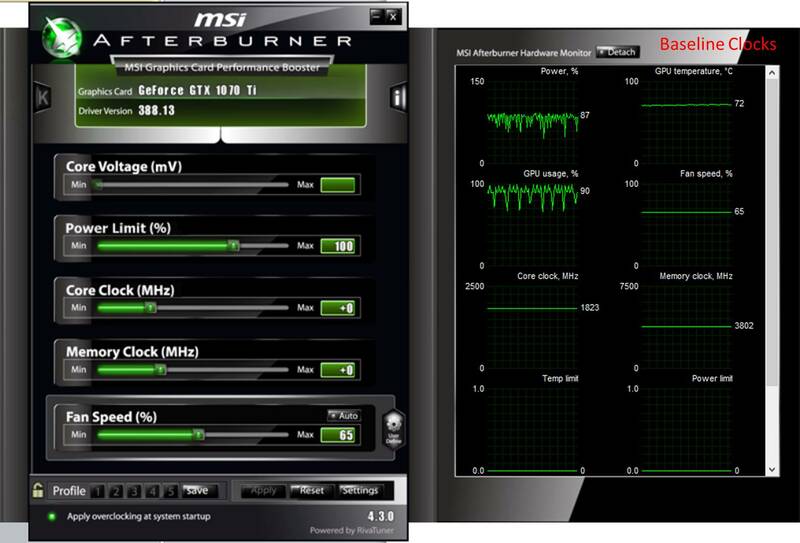 A tool such as MSI Afterburner can be used to view the graphics card’s settings, including the power limit. 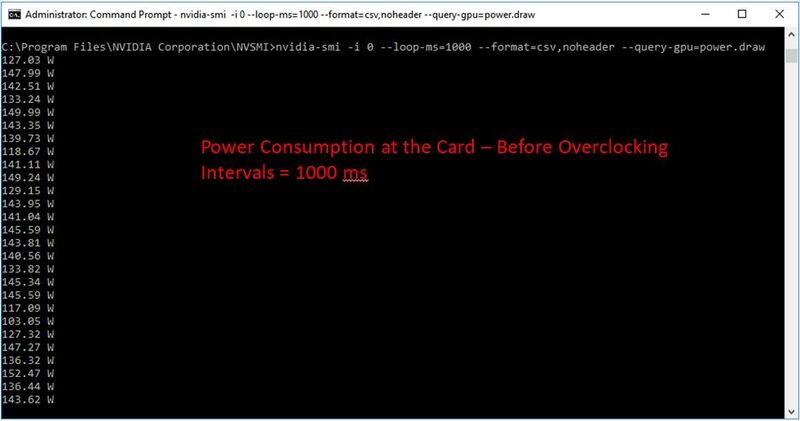 In the below screenshot, I reduced the card’s power limit by 50% midway through taking data. You can clearly see the power consumption and GPU temperature drop. This suggests the entire computer should be drawing less power from the wall. I confirmed this with my watt meter. 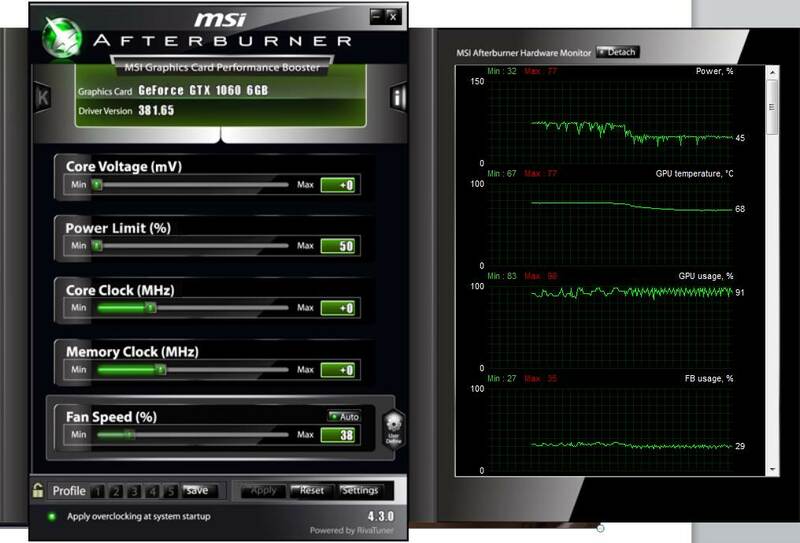 MSI Afterburner is used to reduce the graphics card’s power limit. I ran the card for multiple days at each power setting and used Stanford’s actual stats to generate an averaged number for PPD. Reporting an average number like this lends more confidence that the results are real, since PPD as reported in the client varies a lot with time, and PPD can bounce around by +/- 10 percent with different projects. Below is the production time history plot, courtesy of https://folding.extremeoverclocking.com/. I marked on the plot the actual power consumption numbers I was seeing from my computer at the wall. As you can see, reducing the power limit on the 1060 from 100% to 50% saved about 40 watts of power at the wall. On the efficiency plot, you can see that reducing the power limit on the 1060 actually improved its efficiency slightly. This is a great way to fold more effectively. There is a downside of course, and that is in raw production. 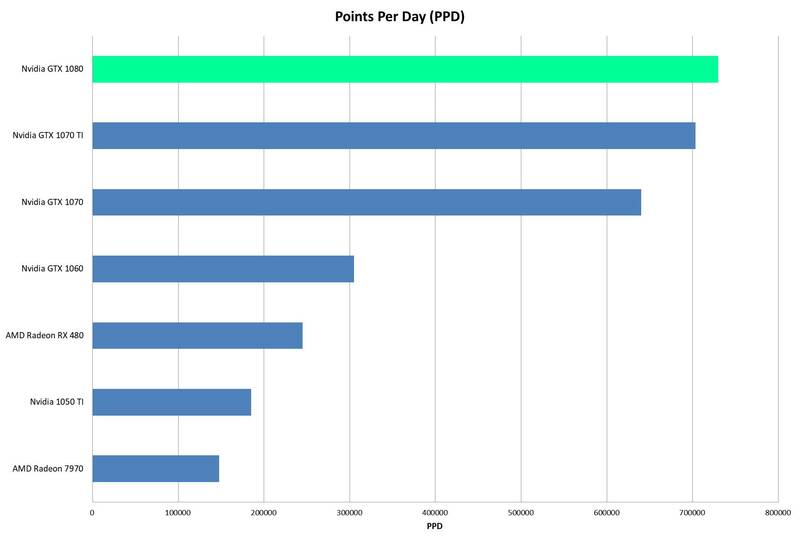 The Points Per Day plot below shows a pretty big reduction in PPD for the reduced power 1060, although it is still beating its little brother, the 1050 TI. One of the reasons PPD falls off so hard is that Stanford provides bonus points that are tied to how fast your computer can return a work unit. These points increase exponentially the faster your computer can do work. So, by slowing the card down, we not only lose on base points, but we lose on the quick return bonus as well. 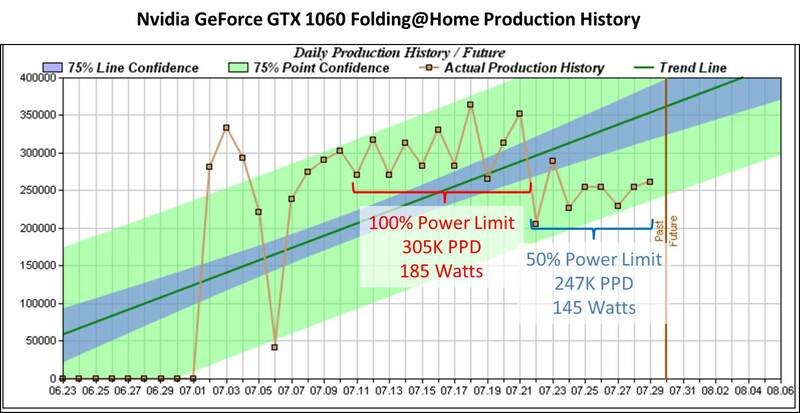 Reducing the power limit on a graphics card can increase its computational energy efficiency in Folding@Home, although at the cost of raw PPD. 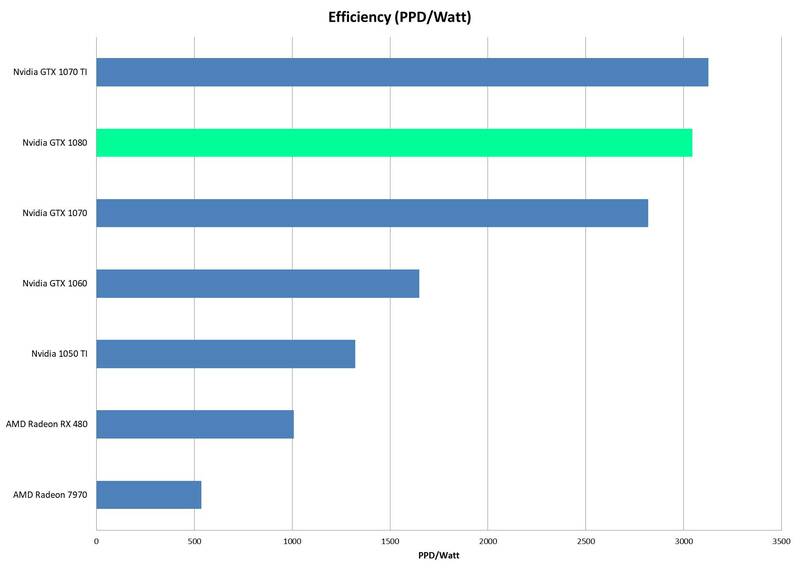 There is probably a sweet spot for efficiency vs. performance at some power setting between 50% and 100%. This will likely be different for each graphics card. The process outlined above can be used for various power limit settings to find the best efficiency point. Folding@home is Stanford University’s charitable distributed computing project. It’s charitable because you can donate electricity, as converted into work through your home computer, to fight cancer, Alzheimer’s, and a host of other diseases. It’s distributed, because anyone can run it with almost any desktop PC hardware. But, not all hardware configurations are created equally. If you’ve been following along, you know the point of this blog is to do the most work for as little power consumption as possible. After all, electricity isn’t free, and killing the planet to cure cancer isn’t a very good trade-off. Today we’re testing out Folding@home on an EVGA NVIDIA GTX 1070 graphics card. This card offers a big step up in gaming and compute horsepower compared to the 1060 I reviewed previously, and is capable of pushing solid frame rates at 4K resolution. So, how well does it fold? For this test I used my normal desktop computer as the benchmark machine. Testing was done using Stanford’s V7 client on Windows 10 64-bit running FAH Core 21 work units. The video driver version used was initially 388.59, and subsequently 372.90. Power consumption measurements reported in the charts were taken at the wall and are thus full system power consumption numbers. I Got a New Watt Meter! Like the GTX 1060, the 1070 uses Nvidia’s Pascal architecture, which is very efficient and has a reputation for solid compute performance. 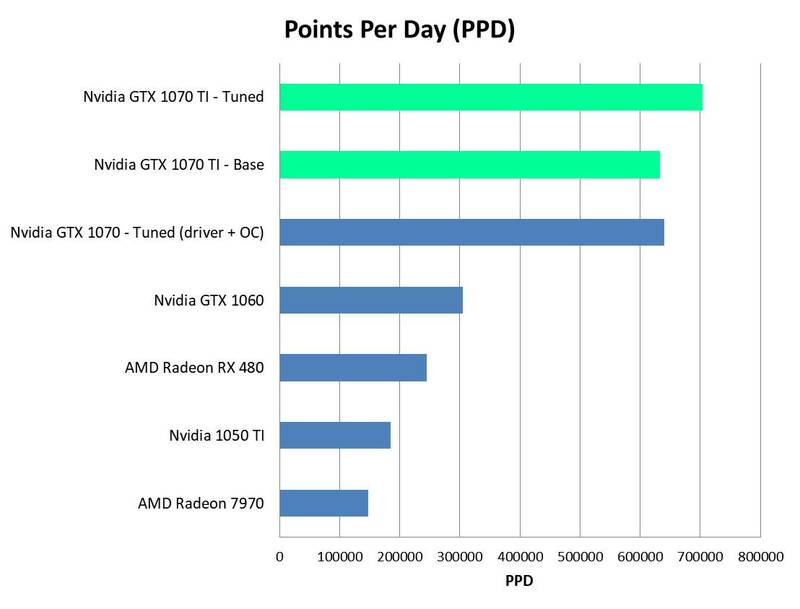 The 1070 has 50% more CUDA cores than the 1060, and with Folding@Home’s exponential points system (the quick return bonus gives you more points for doing work quickly), we should see roughly double the PPD of the 1060, which does 300 – 350 thousand PPD depending on the work unit. Based on various people’s experiences, and especially this forum post, I was expecting the 1070 to produce somewhere in the range of 600-700K PPD. That wasn’t what happened. The card wasn’t exactly slow, but initial testing showed an estimated 450 to 550K PPD, as reported by the client. I ran it for a few days, since PPD can vary a good deal depending on the work unit, but the result was unfortunately the same. 550K PPD was about as much as my card would do. At first I thought it might be due to the card running hot. Unlike my test of a brand new 1060, I obtained my 1070 used off of eBay for a great price of $200 dollars + shipping. 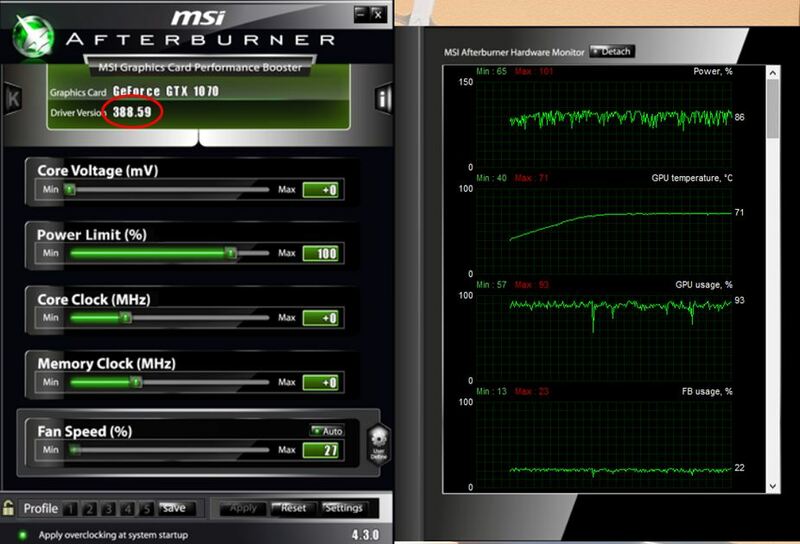 It was a little dusty, so I blew it all out and fired up MSI Afterburner to check out the temps. Unfortunately, the fans on the card weren’t even breaking a sweat, and it was nice and cool. Points didn’t increase. 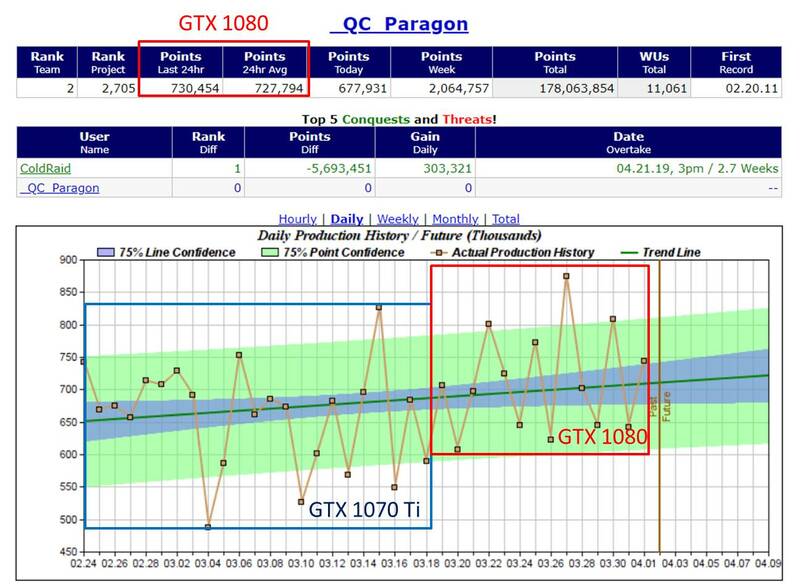 After doing some more digging, I ran across a few threads online that indicated the 1070 (along with a few other GTX models) don’t always boost up to their maximum clock rates for compute loads. Opening up a video, or Folding@home’s protein viewer, can sometimes force the card to clock up. I tried this and didn’t have any luck. My card was running at the stock clocks, and in fact the memory even appeared to be running 200 Megahertz below the 4000 Mhz reference clock rate. This suggested the card was in a low-power mode. Thankfully, Nvidia’s System Management Interface tool can be used to see what is going on. 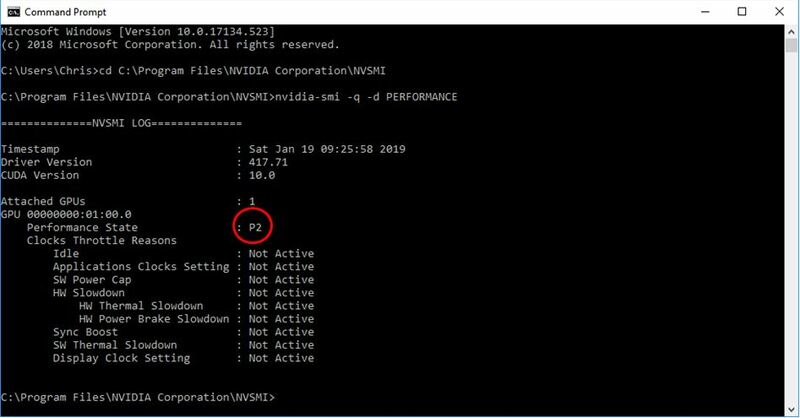 This tool, which in Windows 10 lives in C:\Program Files\Nvidia Corporation, can be accessed by the command line. I followed the tutorial here to learn a few things about what my 1070 was doing. Although that write-up is geared at people mining for cryptocurrency, the steps are still releveant. As can be seen here, my card was in the “P2” state, which is not the high-performance “P0” state. This is why the card wasn’t boosting, and why the memory clock seems diminished. 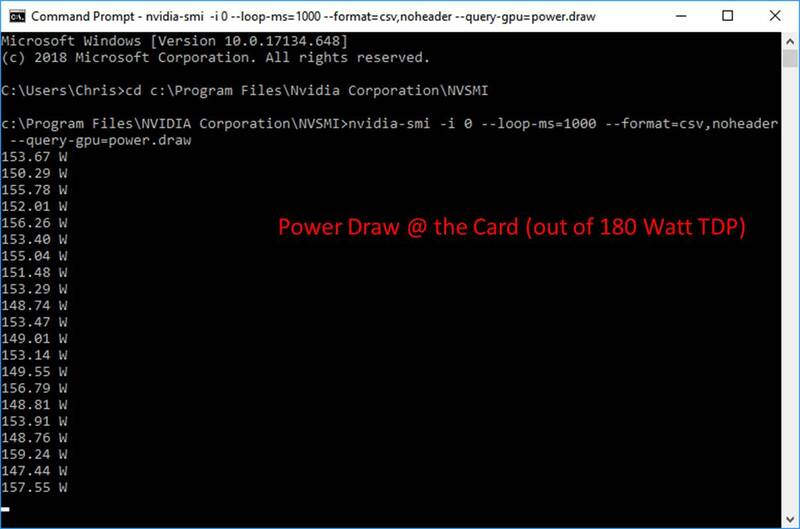 Another feature of the Nvidia System Management Interface is the ability to get the power consumption at the card. This is measured by the driver, using the card’s hardware, and is the total instantaneous power the card is consuming (PCI slot power + supplemental power connections). 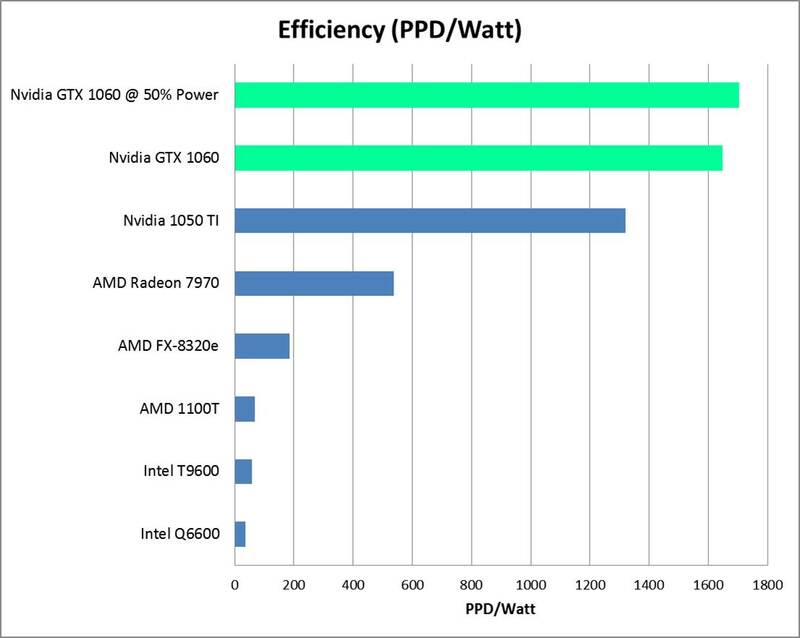 As you can see, in the P2 state, the card is very rarely nearing the 150 watt TDP. Now, this doesn’t necessarily mean the card would get closer to 150 watts in the P0 state. F@H does not utilize every portion of the graphics card, and it is expected that the power consumption would not be right at the limit. Still, these numbers seemed a bit low to me. Unlike what was suggested in that crypto mining article, I wasn’t able to use the NVSMI tool to force a P0 state. For some reason, my NVSMI tool wouldn’t show me the available clock rate settings for my 1070. However, manual overclocking with a program such as MSI Afterburner is really easy. By maxing out the power limit and setting the core clock to a higher value, I can basically make the card run at its boost frequency, or higher. First, I set the power limit to the maximum allowed (112%). Don’t worry, this won’t hurt anything. It is limited in the driver to not cause any damage. Basically, this will allow the card to sip a bit more electricity (albeit at a reduction of efficiency). For a card that was in the P0 state (say, running a video game), this would allow higher boost clocks. Next, I started upping the core clock in increments of 100 Mhz. I didn’t run into any stability problems, and settled in on a core clock of 2000 Mhz (factory clock is 1506 Mhz / 1683 boost). Note that that factory boost number is deceiving, since the latest drivers will crank the GPU core up past 1900 MHz if there is power and voltage headroom. From what I read, many people can run the 1070 stable at 2050 Mhz without adding voltage. I decided not to boost the voltage, and to stay 50 Mhz below that supposedly stable number, because it’s not worth risking the stability of Folding@home. We want accurate, repeatable science! Plus, dropping work units is much worse for PPD than running slightly below a card’s maximum capability. I experimented with clocking the memory up from 3800 MHz to 4000 MHz (note it’s double data rate so this equates to 8000 MHz as reported by some programs). This didn’t seem to affect results. F@H has historically been fairly insensitive to memory clocks, and boosting memory too much can cause slowdowns due to the error-checking routines having to work harder to ensure clean results. Basically, everyone says it’s not worth it. I ran it at 4000 MHz long enough to confirm this (a day), then throttled it back down to 3800 MHz. The benefit here will be more power available for the GPU cores, which is what really counts for folding. Note the driver version as shown in the updated Afterburner screen shot is different…as it turns out, this can have a huge effect on F@H PPD. More on that in a moment. 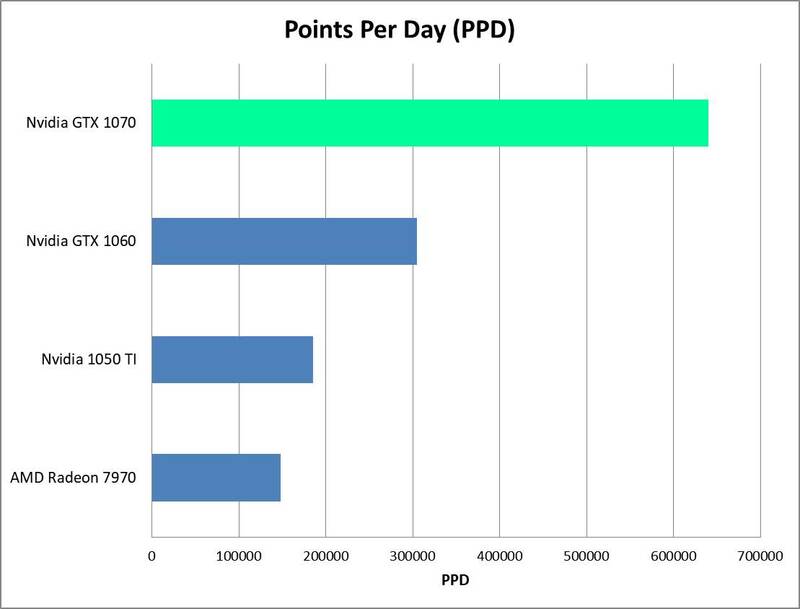 Running the core at 2012 MHz (+160 MHz boost from the P2 power state) and upping the card’s power limit by 12% made the average PPD, as observed over two days, climb from 500-550K PPD to 550K-600K PPD. So, that’s a 50,000 PPD increase for minimal effort. But, something still seemed off. At the time I was still running driver version 388.59, and one of the things I had discovered when searching around for 1070 tuning tips is that not all drivers are created equal. Nvidia has been updating drivers with more and more emphasis on gaming optimizations and less on compute. So, it makes sense that older drivers might actually offer better compute performance. There are many threads in the Folding@Home Hardware Forum discussing this, and one driver version that keeps being mentioned is 372.90. It’s a bit tricky to keep it installed on Windows 10, since Windows is always trying to push a newer version, but for my 24/7 folding rig, I installed it and simply never rebooted it in order to get a week’s worth of data. This driver change alone seemed to also offer a 50,000 point boost. 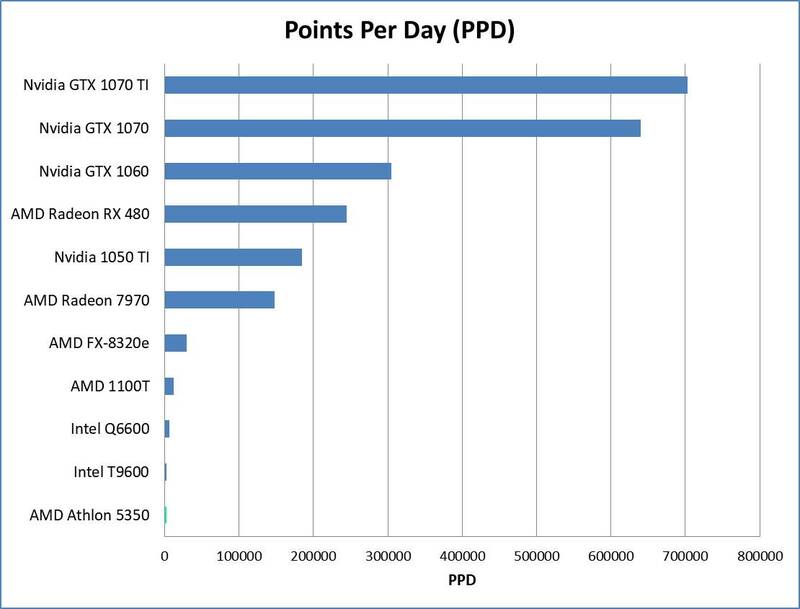 After running various core 21 work units, the GTX 1070’s PPD has stayed between 630,000 and 660,000. This is normal variation between work units, and I feel confident reporting a final PPD of 640K. As I write this, the client is estimating 660K PPD. This is an excellent result. It’s twice the PPD of the GTX 1060, although eking out that last 100K PPD took a manual overclock plus a driver “update” to an older version. Now, for the fun part. Efficiency! This 1070 is rated at 150 watts, which is only 30 watts more than the 1060. So we are supposedly doing 100% more science for Stanford University, and for a meager 25% increase in power consumption. Time to bust out the watt meter and find out! Using my P3 Kill-A-Watt Power Meter, I measured the total system power consumption. This is the same way I measure all of my graphics cards (as opposed to estimating the card’s power by the TDP or using the video card driver to spit out instantaneous card power). The reason is that I like to have a full-system view, factoring in the power usage of my CPU, main board, and RAM, all essential components to keep the card happy. While folding with the GTX 1070, my system’s total power draw varied between 225 and 230 watts. I’m going to go with 227 watts as the average power number. 640,000 PPD / 227 Watts = 2820 PPD/Watt. The Nvidia GTX 1070 is a very efficient card for running Stanford’s Folding@Home Distributed Computing Project. The trend established in my previous articles seems to be continuing, namely that the more expensive high-end video cards are more efficient, despite their higher power draw. In this case of the 1070, some manual overclocking was needed to unlock the full PPD potential. As proven by many others, the default drivers weren’t very good, but the 372.90 drivers really opened it up. As a final note, this post focused more on PPD than efficiency, since for much of the testing my watt meter was not installed (my kids keep playing with it). At some point in the future, I’ll do an article where I tune one of these cards to find the best efficiency point. This will likely be at a lower power limit than 100%, with perhaps a slight reduction in clock rate. It’s been a few months (well more than a few), so I figured I should explain why there haven’t been so many articles lately. I’ve always liked writing, be it technical blogs like this one, writing for work, or writing fiction. Back in 2005, I started writing science-fiction for fun, and last year I succeeded in completing my first novel. I’ve still been blogging, although I’ve been writing about that novel-writing project instead of distributed computing. If you’re interested in learning about the realms of self-published science fiction, then please do check out my blog at starfightersf.com. Another reason for not writing folding@home articles is because I haven’t been folding! Even with solar panels, the amount of electricity we use in our home is astonishing, and adding a F@H energy burden to that didn’t make sense, especially not in the warmer months when it increases the load on the air-conditioning (talk about an environmental double-whammy!). Instead, I decided to wait until it is nice and cold (like right now), so that I can turn down the oil heat in my basement and crank up the folding rig. This way, the electricity serves two purposes: first, charitable disease research for Stanford, and second, heating my basement and saving oil. In terms of being energy efficient, this is the best way to go! So, consider this the official restart of Green F@H for the new year. I’ll be kicking things off with the 1070 I just picked up from eBay for a surprisingly palatable $200. As you might have noticed, I don’t tend to review the latest cards, and that’s simply because of the price tag. Buying last-generation’s cast-off cards used has turned out to be an immense money saver, so if earning PPD/dollar is also on your list of priorities, I highly recommend this method. Stay tuned for the Nvidia GTX 1070 review!